Detective brothers Frank and Joe try to figure out who’s spoiling the fun on a class trip in the third book in an all-new, interactive Hardy Boys chapter book mystery series. Frank and Joe Hardy are super-psyched for their school trip to Lake Poketoe. Along with their friends, they can’t wait to go tubing, make s’mores, and take nature walks. And Joe is particularly excited to try out his brand-new water skis during the trip! But when the group tries to head out for their first day of boating, Joe discovers his skis are missing! Who could have taken them? And how could they have disappeared without anyone noticing? 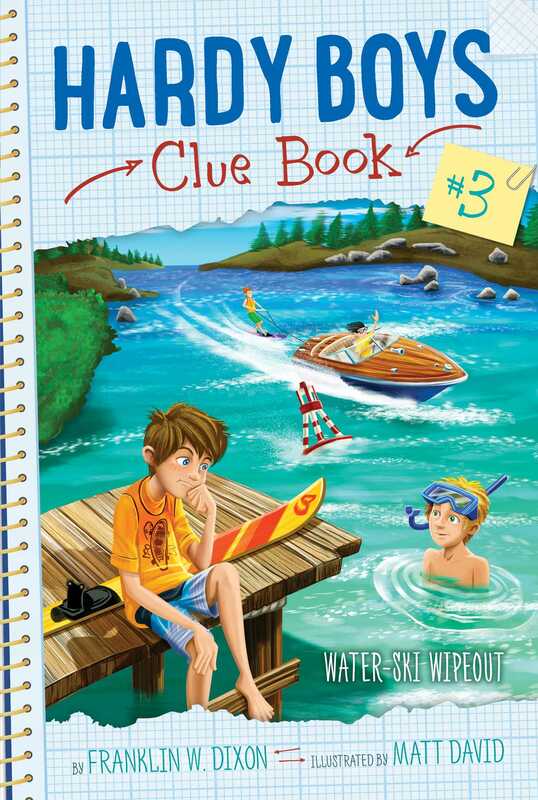 With time running out on their trip, can Frank and Joe figure out who the sneaky ski thief could be? As the tour bus pulled up outside the lodge, Frank and Joe Hardy could see the lake in the distance. Bucks Mountain, the tallest peak near their hometown, Bayport, was right behind it. “You think we could hike all the way to the top?” Frank asked, turning to his younger brother. Nine-year-old Frank looked at the luggage rack above them. His brother’s new water skis were tied together on the luggage rack with a bright blue strap. Last summer Joe had started water-skiing at camp. In just a few weeks, he’d gotten really good. He even tried to ski for a few seconds on just one ski—even though he usually ended up in the water! Joe was so excited about waterskiing, this year their parents had bought him his very own set of skis for Christmas. And he was ready to break them in at the third and fourth graders’ school trip to Lake Poketoe. This would be the very first time he used them.